AOD-9604 is a peptide fragment of the C-terminus of hGH (Tyr-hGH177-191) to which a tyrosine is added at the N-terminus. Studies have suggested that AOD-9604 is more effective than its predecessor AOD-9401 in its ability to stimulate lipolytic and anti-lipogenic activity. 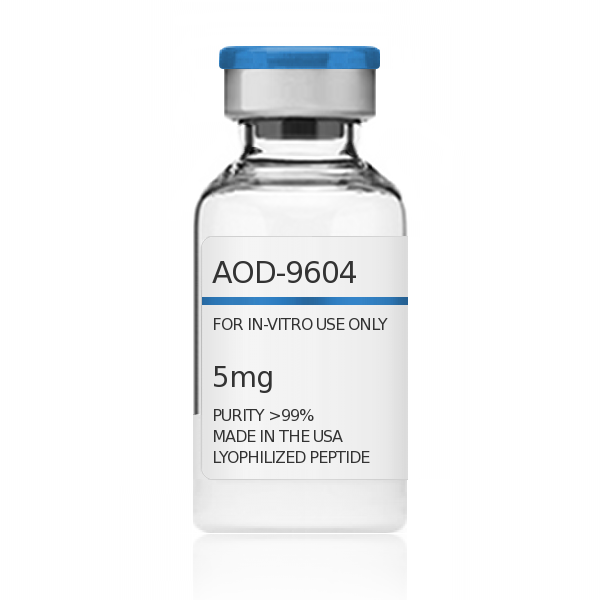 AOD-9604 stimulates lipolysis (the breakdown of fat) and inhibits lipogenesis (prevents the transformation of fatty food materials into body fat) both in laboratory testing and in animals. In laboratory tests on fat cells from rodents, the HGH fragment released fat specifically from obese fat cells and reduced new fat accumulation in all fat cells. GHPeptides™ AOD-9604 has a peptide purity level that exceeds 99.0% as determined by HPLC. This peptide was synthesized with no additives and is supplied as a white lyophilized (freeze-dried) powder. It is recommended to reconstitute the lyophilized AOD-9604 in sterile water, which can then be further diluted in other aqueous solutions. Lyophilized AOD-9604 although stable at room temperature for 3-4 weeks, should be stored desiccated below -18°C. Upon reconstitution, AOD-9604 should be stored at 4°C out of direct light for between 10-14 days and for future use below -18°C. Prevent repeated freeze-thaw cycles.